If you aren’t familiar with the AS/400, don’t worry. It is a server and, like any server, you can configure it. You simply need to learn the basics of AS/400 syntax and AS/400 system architecture. The AS/400 operating system is called OS/400. The version of OS/400 is of the format ViRi, or version i, release i. Here is a table that translates PC and Windows NT jargon into the AS/400 equivalent. The AS/400 is a server, not a workstation and server. In other words, unlike a PC server, there is no connection for a keyboard, mouse, or video connection on the back of the server. You must connect a device of some sort to manage it. (I’ll cover how to do this in the next section.) When you connect to the AS/400 to configure or manage it, you will primarily be using text-based, 5250 terminal emulation, a “green screen.” Later, you can remotely use this same green screen or manage some basic areas of the AS/400 using a graphical user interface (GUI) called Operations Navigator. First, take a quick look at the OS/400 file system. OS/400 has multiple file systems. To help integrate these multiple file systems with the PC environment, the Integrated File System, or IFS, was created. The Integrated File System is a part of OS/400 that lets you support stream input/output and storage management in a way similar to personal computer and UNIX operating systems, while providing you with an integrating structure over all information stored in the AS/400. It allows for UNIX-style directories and file names. It has a root / directory and multiple levels of directories. It is identical in architecture to a PC file system except that it uses the forward slash as a delimiter ( / ) instead of the backslash ( \ ), and it typically resides in one area so there is no need for a drive letter like C:. The most useful AS/400 file system command for PC users is WRKLNK. It lets you navigate through the Integrated File System on the green screen. You should spend some time navigating through the file system to see the files and file types (extensions) on your DSD. By default, the file system has several libraries, which are similar to the folders in Microsoft file systems. 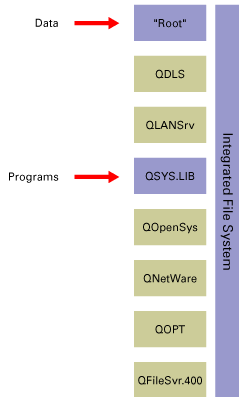 However, one specific difference is that OS/400 puts all libraries in one library called QSYS, and there is no hierarchy allowed. 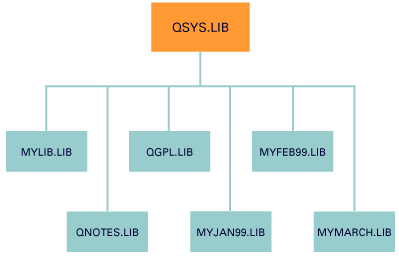 In other words, all libraries in QSYS are only one level deep. Also, the object names have a ten-character limit. For example, YOURFILE.SAVF is an example of an AS/400 file. YOURLIB.LIB is an example library name. By default, you don’t have to specify file extensions. An extension is required only when accessing the objects through IFS; for example, the WRKLNK command accesses the object through IFS, so the extension is required. General Purpose Library. The Library List determines the Path setting of the AS/400. It determines what libraries to look in when you enter a command on the command line. To see it, you can enter GO CMDLIBL.